Summer is officially here. If you’re an aquatic manager or owner – whether your responsibility is at a community pool, hotel or resort – it’s a busy time of year. When it comes to reducing risk at your facility and keeping your patrons safe, it’s important to be aware of a little-known danger: shallow water blackout. Shallow water blackout is an underwater ‘faint’ due to a lack of oxygen to the brain when a swimmer holds their breath for a long period of time. Competitive swimmers in training, spear-fishing and free diving enthusiasts and children practicing breath holding games are all at risk. Without immediate rescue, the swimmer can quickly drown. Even if lifeguards are supervising the pool, they’re often unable to detect that something is wrong until it’s too late. Educating swimmers that prolonged or repeated breath holding while swimming can be life threatening is key. That’s why, here at Clarion, we’re working together with the non-profit group Shallow Water Blackout Prevention (SWBP) for increased water safety related to this hazard. SWBP was established by Dr. Rhonda Milner in 2011 following the death of her twenty-five year old son, Whitner. Today, their mission is to prevent senseless deaths from underwater blackout through awareness and education. “One of our ultimate goals here at SWBP is for safety signage to be posted at all public and private pools. An important safety step that we advocate is posting Clarion’s “No Long Breath Holding” signs at pool-side,” says Dean Haller, Executive Director of SWBP and the father of a shallow water blackout victim. 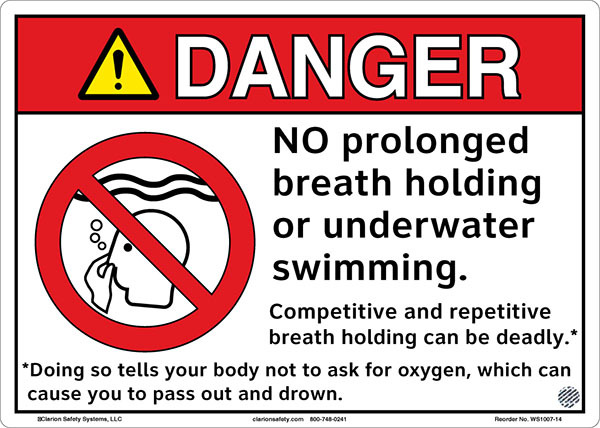 These innovative signs – which are an integral part of Clarion’s pool safety sign system – explain the hazard of underwater breath holding and how to avoid it, using a standards-based graphical symbol to convey the message to all age groups and across language barriers. Visit SWBP.org’s website for safety facts and resources. Visit Clarion’s pool safety sign learning center with some of the latest safety news on shallow water blackout. Watch Clarion’s 4-minute video, “Drowning Prevention: Shallow Water Blackout,” which includes an interview with Dr. Milner. Have a question about water safety and signage at your pool? We’re here to help: contact us today!